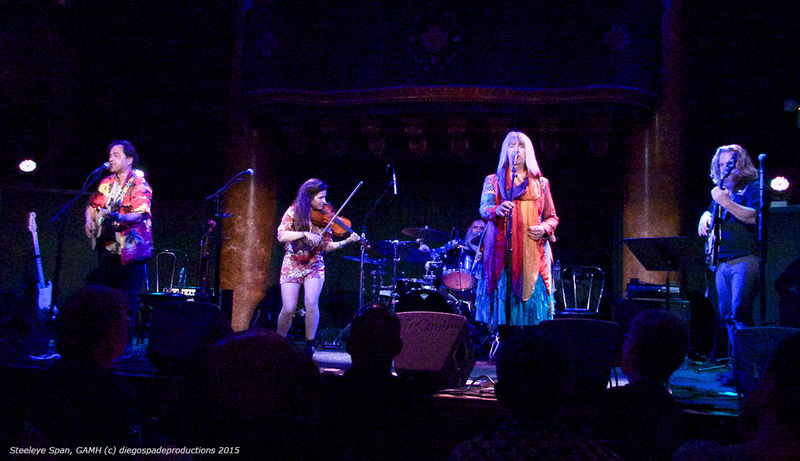 Steeleye Span played the Great American Music Hall July 16th, 2015. They are one of those bands that never made it into my collection, though I have friends that are fans, and have heard some of their influential British folk and roots music over the last 45 years. 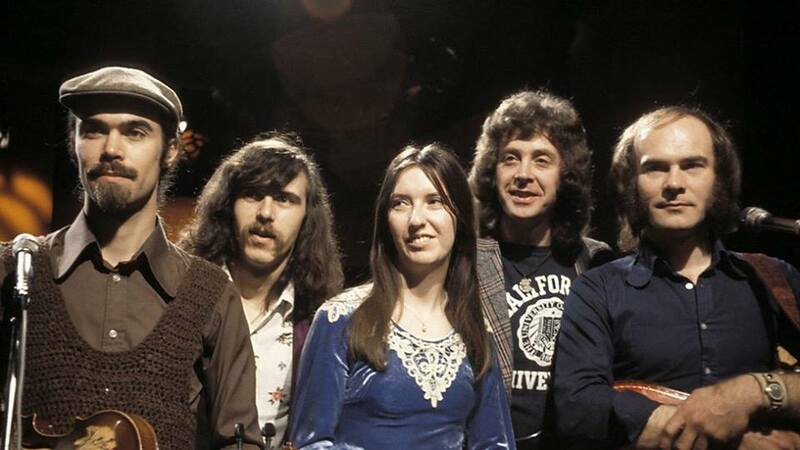 In fact Steeleye Span has been held in high regard internationally for decades, beginning with their debut album in 1970, and they have a couple of hit singles and three Top 40 albums to show for it. I’ve always been a bit more attracted by the renaissance era and progressive influences found in groups like Gryphon, but am learning to appreciate folk and roots music as time passes. What we discovered at the show last week was a band that’s held up exceptionally well, as the current lineup is able to put across their brand of folk-rock with an uplifting and engaging show. The band’s lineup has changed frequently over the years, and Maddy was the only founding member on board for this latest tour. The rest of the group consisted of Julian Littman (guitars, vocals), Liam Genockey (drums) and amazing violinist Jessie May Smart, who played beautifully and added vocal harmonies throughout. 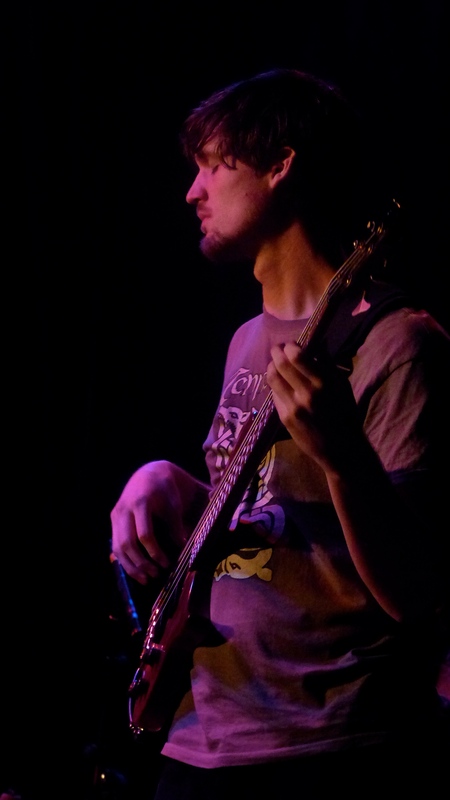 Alex Kemp, Maddy’s son was intended to play bass instead of his father Rick Kemp, but lacked the paperwork to make it past border control for their US dates and was replaced by stand in. The band was tight, and focused on playing in unison behind their multi-part vocal harmonies, so key to the performance this traditional music. While Julian stepped up a few times to play some lead solos, it was Jessie who remained the focus instrumentally, with her virtuosic playing on full display. This was a pleasant evening of traditional music from Britain and beyond, and a feast for fans of the band that welcomed Maddy and the group with rapturous applause and undivided attention. 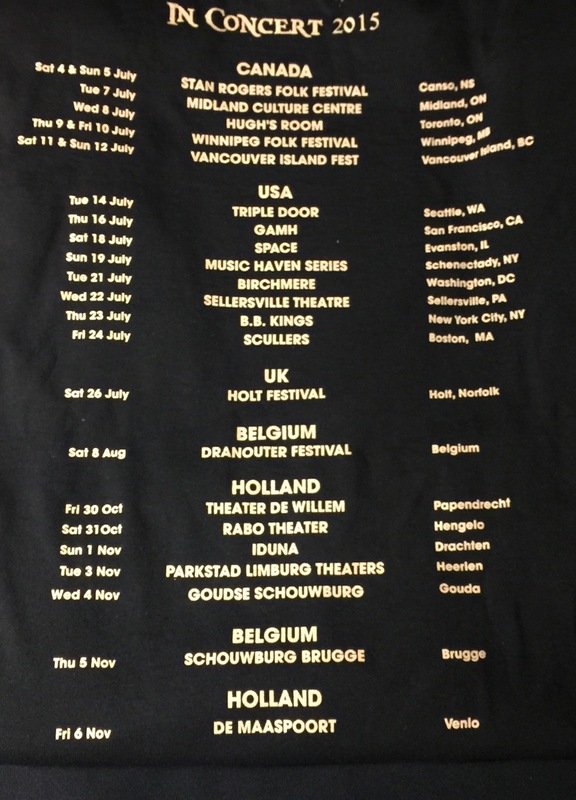 The tour continues in the U.S. into July, then returns to Europe and the U.K. into mid-December, for all those inclined to celebrate the band and this rich musical heritage. 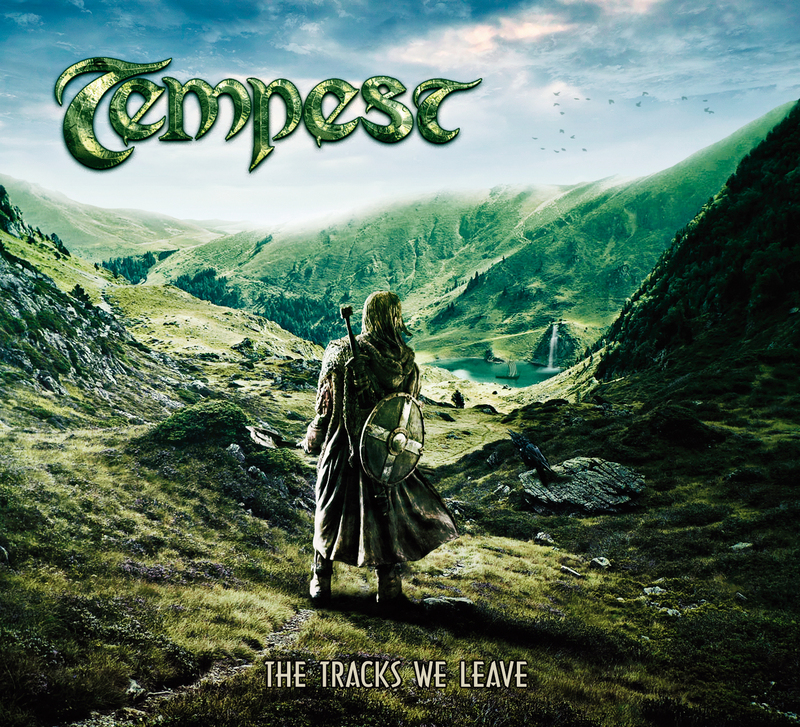 Tempest are releasing a new studio album, The Tracks We Leave, on February 24th, 2015 – another in a legacy of more than fifteen quality albums over the last 26 years. 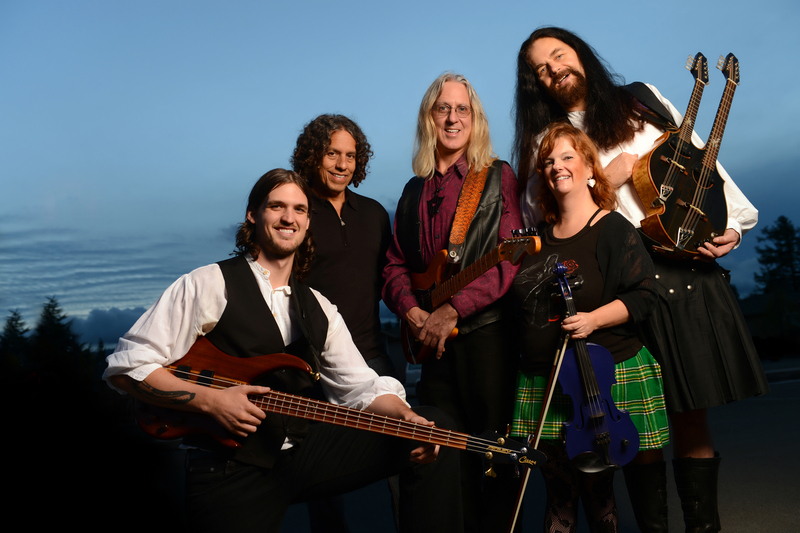 For the uninitiated, Tempest’s music can best be described as a form of folk rock, incorporating a blend of Celtic, Scottish, Norwegian, and other world music influences within a rock format that often leans towards the progressive. Standout tracks on their new release include the eclectic title track, the Norwegian language “Alle Mann Hadde Fota” (All Men Have Feet), the soft then edgy folk of “Fog On The Bay” (a San Francisco favorite) and closer “Surfing to Mecca” a fun and boisterous remake of their 1994 original sporting tandem fiddle and flute leads. It’s a potent brew of traditional folk and rock musical forms, all of which goes down easy, while also inspiring dance in any fleet-footed listener. We caught their recent gig at Don Quixote’s in the small town of Felton, California on a stormy night during which they presented their new album in its entirety. Multi-instrumentalist, composer, and singer Lief Sorbye fronts the band, as it’s founder, and he leads the procession from center stage, playing his double-necked electric mandolin, guitars, flute, and other instruments. He is backed by long time drummer Adolfo Lazo, and new able bass player Josh Fossgreen, who adds adept riffs and solos during their frequent jams. 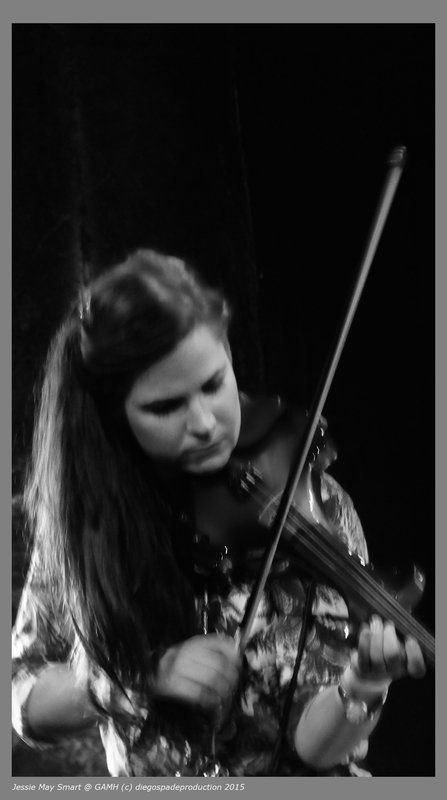 Newer member Kathy Buys, is an award winning fiddle player and vocalist – she plays leads and recalls the best of folk traditions with her lightning fast, rhythmic delivery. 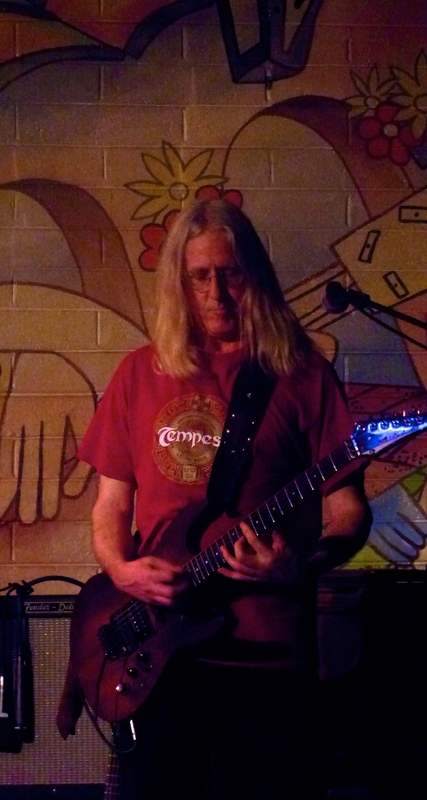 Greg Jones plays electric guitar, often adding a harder rock edge to the mix, always invigorating the whole. The band plays together in a loose but practiced manner, exuding an infectious joy in presenting their music to fans and new converts alike. D: Is there a new direction on this album, a change for Tempest? Our musical policy has always been open. When I started the band, I called the music “Celtic Rock” because we needed a label to put on the music we were doing, and people had an idea of what “Celtic” was and certainly what “rock and roll” was, so that was the label we used then in order to get record deals and gigs to play. But it was always a wide-open type of platform – we incorporated music from the British Isles, and Scandinavian influences and Norwegian songs, which have always been part of the Tempest repertoire for the last 26 years. We never said, “no you can’t touch on this or that” – the backbone has always been inspired by and steeped in traditional folk music. Together it always sounds like “Tempest” music and that’s the case with the new album – its part of our history. I don’t know if it’s pointing in a new direction or just painting on the large canvas that we’ve called our own. When we went into the studio for this new record and worked on it for a month what we come out with is an album of material that’s also a document of this period in the band’s life. Looking back over our 15 or so albums over time they tell a story – they are each real recordings of places and times. We try to do that when we record. The stylistic influences you hear on the new record are a product of the people that are playing together at this point – the stuff we are interested in right now – people bring different things to the table. It’s a spontaneous, organic process. D: Kathy is bringing some wonderful playing to the band, and this lineup is changed much since the last record. Yes, it’s a li neup that has not recorded before – it’s been 5 years since our last studio album, Another Dawn (2010). That was a culmination of the lineup 2005-2010. After that, we waited to go back into the studio until we had something to say. There’s no point to making a record unless you have something to say – musically or otherwise. You’re making a statement and it’s there forever. The chemistry in this particular band is really important, and we had a great experience together in the studio. Everybody was really excited about the music coming alive during the recording process. We are predominantly a live band – a working band. We play gigs frequently and that’s where the music comes alive for us – so normally we play the songs live first, get them road tested, and then bring them into the studio. This time was a bit different – we had at least a third of the album that we played for the first time in the studio. Everyone worked diligently, had fun, and left good tracks behind, and that’s the title of the album The Tracks We Leave– I felt we left some good footprints for the future and there was a lot of joy in it. D: I noticed one of the tracks “Surfing to Mecca” was very tight in concert – the flute really stands out – dueling with Kathy’s fiddle. 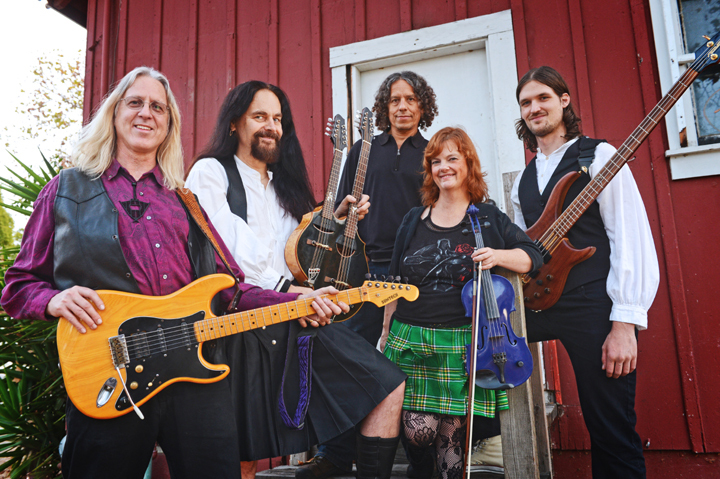 That song, “Surfing to Mecca” is the last track on the album, and probably the furthest away from a Celtic rock song, and that’s a bonus track because it’s an older Tempest song from 20 years ago that we re-recorded – it was the title track from our 2004 release. I had started playing flute again, which I’ve picked up again after not playing it for a long time. Because of that we started playing the song live, which was a hit with our crowd 25 years ago, so we decided to put it at the end of the album. It’s not that different from the original version, though we added Arabic-style drumming to give it a bit more of that flavor. I pick up the flute when I feel the time is right, but have never played it consistently – I have a love/hate relationship with it – now I’ve had it with me as part of our repertoire for the last year and its probably the longest I’ve played it ever. I do play in on Turn of the Wheel (1996) which I think is one of our strongest albums and one of my favorites, and it’s on there because the folks at Magna Carta asked me to play it. 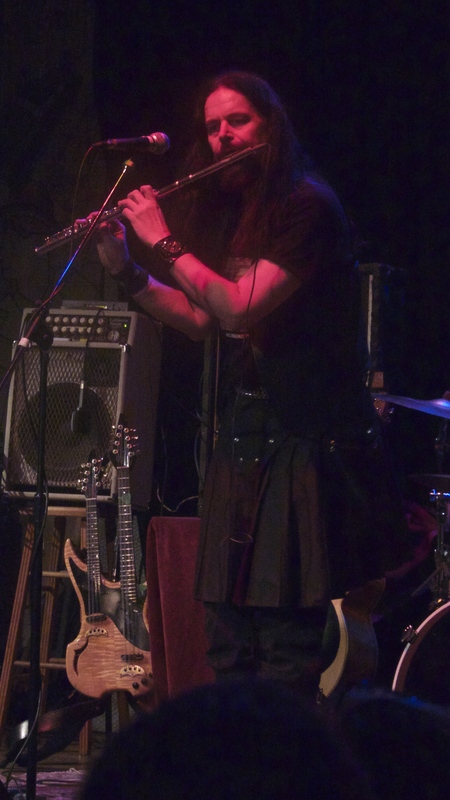 With the flute, I feel like I’m dabbling, but I put as much heart and soul into it as possible. If you listen to early 70’s jazz-fusion –like Herbie Mann, and others, flute is all over the place. Then it found a home on late night detective shows with the usual wah-wah guitars and all of the sudden it dropped off the planet. But it’s a cool instrument combined with a fiddle because they are known fixed pitched instruments – you can do a lot of interplay. Right now its fun to play, even though it can be difficult to play and be heard in a rock band! D: The cornerstone track on the new record is the title track “The Tracks We Leave”- I noticed that keyboards are used on that song, which seems rare. We have used keys over the years – when we record, Robert Berry becomes like the fifth member of the band, for those occasions where keys add to the soundscape. The history of Tempest is that when I started the band I did not want to have keyboards. Back then it seemed there was no label we really fit into – too much rock to fit in on a folk label and vice versa. I always thought we were progressive with what we were doing with folk music, so I always thought of us as a prog band, but not your classic prog band. So at that point in time, it made the most sense to work with Magna Carta. When we signed with Magna Carta, and their prog rock stable, we were told we should have keys on the record and in studio as they are must-have’s for the kind of music they were after. 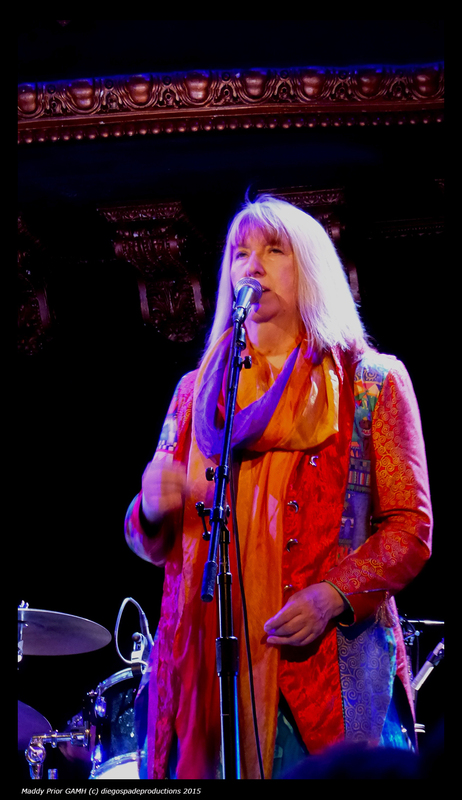 I met with a few keyboard players, and we started working with Robert Berry as a producer and engineer – he had a band called 3 where he played with Keith Emerson so I asked him if we could get Keith to play on the record, he introduced us, and we hit it off. Back then people were dabbling in DAT tapes, so we traded back and forth and Keith recorded in LA – what he did was really cool, and it worked well – I think that helped us with the prog community. We’ve always used keys carefully so you wont miss it on stage – we never arrange a song with keys as the featured instrument. Though the title track this time has a bit of grand piano, most of the time we only use a Hammond B3 organ. That’s the keyboard that has the great organic sound, like Jon Lord, I love that sound and it fits with our music. D: “Alle Mann Hadde Fota” was a standout track during the show. Reading the English translation of these Norwegian lyrics, the story seems a bit unusual! Especially if you try to translate it directly –it’s very curious – it has a macabre nursery rhyme quality to it. During my upbringing I believed in some of our folklore, like Trolls – if you’re a kid and you walk around in a dark forest in that part of the world, with its majestic mountains – rich in that heritage – it’s possible to believe! A lot of cultures have their own characters and share them – it’s fun to dabble in that as inspiration and source material for a rock band – as it’s been around for 100’s of years – being able to keep that around and drink from that well is great. When you are inspired by so many traditions you never run out of things to create. Back to the title track, the melodic and harmonic structures in “The Tracks We Leave” for instance are steeped in the traditional music of those northern hemispheres. That proverb “we will be known by the tracks we leave” was a Native American proverb. I liked that, and Robert said that would be a great title for an album, so I snagged it and then needed to write a song with that title. Record companies like it when you have the title in advance – you can plan graphics and start talking about the work publicly. Normally I like the title to come spontaneously while recording the album – usually something happens in the studio while creating, and the title appears. This time I had it in advance. The reaction was “Oh of course – you are a musician – and you are recording tracks, leaving tracks behind” and I think its got other meanings too – the ecology of it – leaving a carbon footprint and the tracks you leave on the planet, and then there is the spiritual aspect. Last summer, my wife and I went back to Norway to visit my mother and we three took a holiday in the mountains in a rustic cabin – a significant experience with a profound impact on all of us. Patricia has been writing with me for a long time and wrote the lyrics and it all fell into place. The song was the last thing that got written and arranged just before we entered the studio. It was fun this time to have the title and concept before we had it all finished. D: What are your plans for touring to support the album? We’ve worked up a three-hour repertoire for the road, so we have lots of material to play – lots of variety. We are doing a series of 20 concerts in Las Vegas on the week of St. Patrick’s day, where we wanted for our own sanity to be able to play different shows, with some alternate tracks, so we will have a good time on stage, which will be our home for the week. From there we embark on a wider tour of the states. Though we will play tunes from throughout our history, I like our Magna Carta releases better than what we recorded before 1995 – we’ve had the opportunity to record throughout the history of the band – from day one. It’s all there showing the progress of the band. For our fans, their favorite is always the record they got when they discovered us, when they got introduced to our music, which might be the time they were introduced to Celtic or traditional music – ours might have been an eye opener for them – when that happens we treasure that. We have a huge catalog to play from and we listen to fans requests – sooner or later everything comes around again. And of course we will play several tunes from our new record – which is high-spirited, and fun – if you arrange traditional folk and dance tunes a certain way you have all sorts of tempo changes and time signature changes and all the elements you would find in classic prog rock. You can add anything to rock and roll and make it your own – it’s a great form of expression. Recommendation: get yourself a copy of the new Tempest album The Tracks We Leave when it’s released this month, and catch them live this year, in sunny Las Vegas if you can make it!